"Father, forgive them;they don’t know what they’re doing." Ask someone if an unforgivable event has happened in their lives and you may find yourself looking in the face of at least one of these emotions–pain, anger, hurt, sorrow, bitterness, doubt, frustration, resignation, hardness. It’s the look of the unforgivable, unforgiven. There will be those faces, however, that register peace and contentment. Here is the summit of the unforgivable now forgiven. 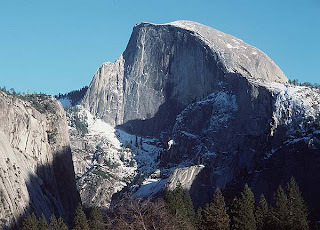 Beaten, publically humiliated, hanging exposed for all to see, Jesus knew exactly what it took to climb "Half Dome". For three years people hadn’t been able to get enough of him. He was at the top of his game! Judas’ betrayal, Peter’s denial, the disciples disappearance and Pilot’s judgment, quickly turned it all upside down. Immobile, weakened and alone Jesus prays, Father, forgive them. Forgiveness begins with this prayer. It tells us Who will meet us at the base of the climb. Paralyzing emotional pain can stop us from finding our way up our forgiveness "Half Dome" but our Father knows the route. The prayer of Jesus points us to the first foothold on the wall, Father, forgive them. Thought for the Day: Where do I need Jesus to lead me to forgive? I trust You to show me the route, one foothold at a time.